After a record-breaking first season in college baseball, FIU catcher Jose Garcia was named the 2018 Conference USA Freshman of the Year on May 22 in a vote by the league’s coaches and sports information directors. 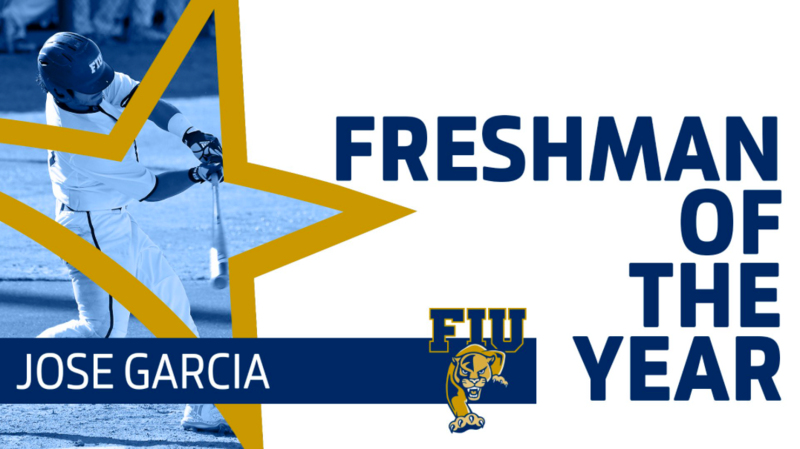 Garcia broke the FIU freshman home run record with 13 long balls in his debut season. He surpassed former FIU slugger Jabari Henry, who hit 12 home runs in 2010. Henry also went on to win the Sun Belt Conference Freshman of the Year award that season. One of 14 recruits in Head Coach Mervyl Melendez’s 2017 recruiting class, Garcia is hitting .271 with 13 home runs and 38 RBI on the season as FIU prepares to open the Conference USA Championship against Florida Atlantic on May 23 (10 a.m. EDT) at MGM Park in Biloxi, Mississippi. Garcia is tied for fifth in C-USA in home runs, trailing his teammate Eddie Silva, who leads the league with 15 home runs. Garcia is slugging .571, which is seventh in the conference. Among Garcia’s other numbers, he has 46 hits, in which half of them (23) have gone for extra bases. Besides his 13 homers, Garcia has eight doubles and two triples. He has scored 34 runs and has 97 total bases, which is third on the team. Garcia is the second FIU player to win the Conference USA Freshman of Year award since the Panthers moved into Conference USA in 2014. Former FIU right-hander Chris Mourelle was the league’s Freshman of the Year in 2014. With Garcia’s honor, FIU has now collected a Freshman of the Year award in three of the last nine seasons. Henry won it 2010, Mourelle in 2014 and now Garcia.